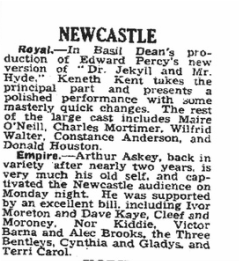 The Stage - 6 March, 1947. The Grand, Blackpool. 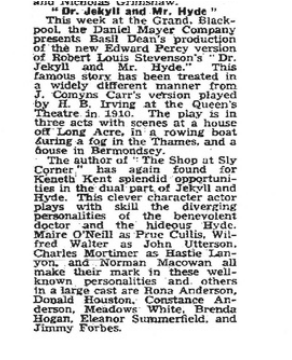 "Maire O'Neill as Prue Cullis, Wilfred Walter as John Utterson, Charles Mortimer as Hastie Lanyon, and Norman Macowan all make their mark in these well known personalities....."
The Stage 1947. Theatre Royal, Newcastle upon Tyne. "The rest of the large cast includes Maire O'Neill, Charles Mortimer, Wilfred Walter, Constance Anderson, and Donald Houston." From The Aberdeen Journal of 18 March, 1947. "FULL-BLOODED "DR JEKYLL AND MR HYDE"
Any dramatisation of R.L Stevenson's sixty-one-year old story, "Dr Jekyll and Mr Hyde," must be in terms of melodrama, and Edward Percy's new stage version at His Majesty's Theatre, Aberdeen, this week is direct tradition with those by T. R. Sullivan (in 1888) and Comyns Carr (in 1910) —it doesn't mince matters. Stevenson designed something horrific and melodrama alone will produce that effect on the stage. Stevenson also drew a moral to his tale and some of that is in the play too. The problem with melodrama nowadays is the audience's, not the players' How to react? Either are harrowed and chilled or else you laugh out loud. You can do either at this play and still enjoy it thoroughly. 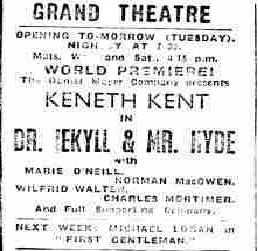 True it is difficult to take the first two acts of Mr Percy's well knit piece seriously, but in the first scene of the third act- in the interview between Jekyll and Dr Lanyon, it isimpossible not to be thrilled. The scene is as well played as it is written. The mood is realism, whether or not the situation is accepted and Basil Dean's production, highly ingenius in its mechanics, most careful in minute detail, and sensitive to each dramatic effect, strives after every illusion. The playing is as full blooded as the title role—a feat of terrfic virtuosity. His contrast between the two personalities is the obvious side to his performance, but it is the smaller touches which fill out the two characters greater than life-size. He is admirably supported by a large cast, from which Charles Mortimer must be singled out for helping to make the first scene of the third act go so well. Maire O Neil, of course, can make any part seem child's play, but as Prue Cullis, she brings grimness as well as exuberant humour to her one scene. Rona Anderson, Donald Houston, Constance Anderson Wilfred Walter, Brenda Hogan, Eleanor Surnmerfield, Meadows White, Norman MacOwan and Jimmy Forbes all do well and fit into the fantastic picture. .... and His Majesty's Theatre, Aberdeen. .... and The Grand Theatre, Leeds. Taken from the Press and Journal, 15 March, 1947.